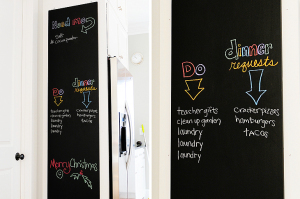 A chalkboard, conveniently placed in the heart of the kitchen for everyone to access. I’m pretty handy with things, but I’m also blessed with my own handy man, Randy, who also serenades me with song, and can do a mean shadow puppet on the fly. Handy Randy took charge of this one for me. I told him what I was thinking as far as size goes, and that I wanted a simple chalkboard without a frame, nothing fancy.